I realized that when I'm talking about the plot of these stories, not only does it generally give everything away but I'm going into too much detail. I'm going to start just VERY briefly talking about them by just going off the top of my head. Expect these to start getting a little bit shorter. Season Twelve ran from December 28, 1974 to May 10, 1975. It contained twenty episodes across five stories. This season brings in the legend himself, Tom Baker and with him comes the glorious era where we have the most iconic Doctor and the most iconic companion working together. We also gain a second companion in Harry Sullivan. Harry was originally created because the producers wanted the fourth Doctor to be another older gentleman like William Hartnell. They hired Ian Marter for the part before they hired a replacement Doctor. However, all of the older actors refused the part and they ended up hiring Tom Baker who was much younger, stranger, and fitter. Harry wasn't really a necessity anymore, and his character suffered for it. He leaves at the start of next season. This season also has quite possibly the longest segments of stories that absolutely happen back to back as the TARDIS is missing for the majority of the season. Season Thirteen ran from August 30, 1975 to March 6, 1976. It contained twenty six episodes across six stories. This season was when the new production team really got to stretch their legs and do what they wanted. As such, this really began the golden era for Tom Baker. The show became even more popular during this season as the stories were overall excellent. This high quality and popularity would only last for a few seasons but it's definitely quite a ride. The first story of Season Twelve is Robot and it's four episodes long. The Doctor has recently regenerated and his regeneration madness this time has taken form in semi-conscious ramblings and not knowing what clothes are appropriate for the time period. The Brigadier has Lieutenant Harry Sullivan look after the Doctor, but the Doctor gives him the slip and breaks for the TARDIS. The Brigadier convinces the Doctor to stay as plans for a disintegration gun are stolen. A group of scientists running a Think Tank have created a robot and intend to use him to steal the nuclear missile codes and hold the world hostage. The robot, however is having an existential crisis due to his programming and accidentally kills his master then goes semi-berserk. The Doctor must stop the nuclear codes and save Sarah Jane from an ever growing robot who has grown an attachment to her. This story is fairly weak. I would call it the weakest regeneration story, but the Twin Dilemma exists and few things are worse than the Twin Dilemma. It's not a bad story it's just nothing overly spectacular. Effectively it's King Kong with a robot instead of a gorilla and it involves nukes. If that sounds like it'd be interesting then check it out. When a new Doctor takes over, the production team had generally already laid the ground work for the first couple of stories for him. As such, this is basically a Pertwee story with a different Doctor. Unit is involved, it's earth-bound, and the Doctor drives Bessie. Given what the Tom Baker era eventually became coupled with how good many of his stories were... it just makes this one weird. This also begins a series of stories that pretty much have to be told back to back as the next story opens with their first trip in the TARDIS together. The next story is The Ark in Space and it's four episodes long. The TARDIS lands on a very old space station where the human race has been in suspended animation until the Earth is inhabitable again. While there, they find the mummified remains of an insect creature. One of the medical officers, Vira, is revived from suspended animation who also revives their leader, Noah. After some investigation, the Doctor informs Vira that they have overslept in suspended animation for several millennia thanks to the insect infestation's sabotage of the control system. 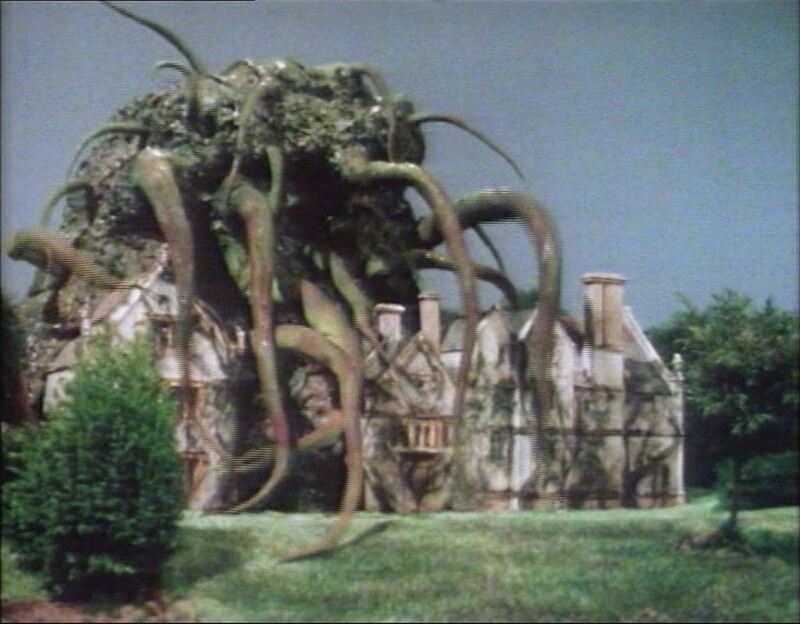 Noah accuses the Doctor of this but becomes infected by the insects and slowly transforming into their swarm leader. Eventually Noah leads the entire swarm on an assault of the Doctor and crew and end up on a transport ship which the Doctor has set on autopilot. The last spark of humanity in Noah reappears as he tells Vira goodbye and explodes the transport ship. The human race can now be revived and returned to earth, but the transmat system isn't functional due to the age of the transmat segment on Earth. The Doctor, Sarah Jane, and Harry transport down to Earth to fix the receiver. This is a fairly decent story. I generally enjoy science fiction stories where a character is going in and out of his humanity and this one does a good job. Unfortunately some of the effects are kinda laughable especially when the leader is in his in-between stage; he's basically covered in green bubble wrap... but again if I'm going to focus on the special effects then I'm watching the wrong eras of the show. It's also during this story that the Doctor gives one of his more notable "humanity is amazing" speeches. The next story is The Sontaran Experiment and it's two episodes long. The Doctor, Sarah Jane, and Harry have transported down to Earth. The Doctor begins fixing the transmat receiver while Sarah Jane and Harry go exploring the uninhabited earth. The group are eventually separated and Sarah Jane learns that a Sontaran named Styre was sent to Earth to experiment on humans so that the Sontaran fleet know the most effective ways to kill them before they invade. Styre has been brutally experimenting on the humans he had lured back to Earth and does the same with Sarah Jane. Eventually the Doctor and Harry rescue Sarah Jane. Harry and Sarah Jane go to Styre's ship in an attempt to sabotage while the Doctor faces off with Styre one on one. The Sontaran flees to recharge himself but the sabotage kills him. With Styre's mission a failure, the Sontaran fleet call off the attack. The Doctor, Sarah Jane, and Harry transmat back up to the space station... or so they think. This one is a good one for fans of the new show to watch. It's about as long as an episode of the new show and it's the classic show at its most dark and unpleasant. It's an interesting look at the kind of tones and themes that they could be doing. It's just a shame that the actor playing Styre was sick to the point of death. 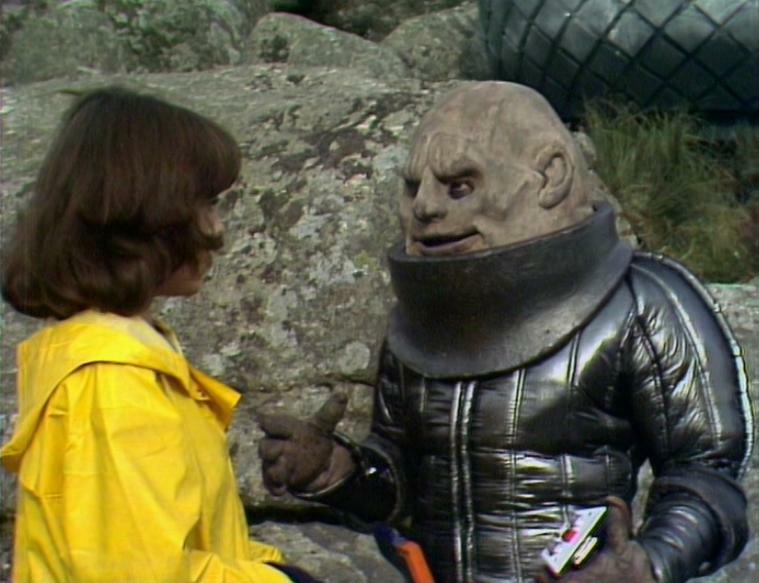 He played the original Sontaran and was supposed to use the same mask and costume from The Time Warrior, but due to his massive weight loss thanks to the disease which eventually killed him, the mask was far too loose; it's even kind of loose here. Also during the shooting, Tom Baker injured himself. This has the unfortunate consequence of a fight scene between an injured man and a dying man which makes that whole sequence fairly terrible. Other than the fight scene though, this is a great one. The next story is Genesis of the Daleks and it's six episodes long. While the Doctor, Sarah Jane, and Harry are being transported back to the space station, the Time Lords have other plans and cause them to be transported across space and time to interfere in the creation of the Daleks. They are given a time ring to activate in order to be taken back to the space station. While on Skaro, they find a great war between the Thal race and the Kaled race that has utterly destroyed the majority of the planet. The Doctor is captured by the Kaleds and is present when the Kaled chief scientist, Davros, is there to unveil his new "Dalek" weapon. However there is concern among the Kaled elite and with the Doctor's help, they decide to halt Davros' mutation experiments. Davros, however, covertly sends a chemical to the Thals which would destroy the Kaled base which they use almost immediately. Due to this savage attack, Davros creates more Daleks and removes compassion so that they may exterminate all of the enemy. With the ensuing chaos, the Doctor has the chance to destroy the Dalek incubator but wonders if he truly has that right. The choice is avoided when a friendly Kaled informs them that Davros has succumbed to their wishes for him to stop and wants it to be put to a vote. This turns out to be a ploy as it gave time for his Daleks to return and exterminate those who sided against Davros. The Doctor sends Harry and Sarah to safety and returns to destroy the incubator but a Dalek accidentally completes the explosion circuit and does it for him. 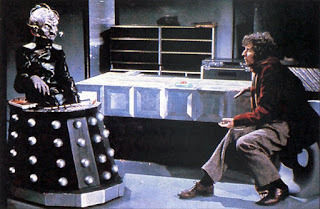 The Daleks action on their impulses against Davros' will and start production on new Daleks. Davros goes to hit the self-destruct but is shot by a Dalek. Though the Daleks were not defeated, they have been hindered for at least a thousand years. Believing this to be good enough, the Doctor and his companions activate the time ring. This is the first of the all-time classic Tom Baker stories. It completely changed the dynamic of the Daleks for both good and bad. This opened up many more opportunities for stories within the show but it also somewhat reduced the Daleks to soldiers under Davros who just keeps coming back to life for no reason. It also has two very iconic moments when the Doctor talks with Davros and when the Doctor asks "Have I that right?" The Kaleds were also heavily influenced by the Nazis which makes it even the more hilarious as Guy Siner is one of the Kaleds. Siner also played an incompetent Nazi on 'Allo 'Allo! which is a fantastic show I suggest you watch some of. But because of that show, I can't quite take him as seriously as I should as a Kaled. Either way, this is a fantastic story that you should check out! The last story of season twelve is Revenge of the Cybermen and it's four episodes long. The Doctor, Sarah Jane, and Harry arrive back on the space station Nerva but everything isn't quite what they remember. In fact, they have been sent back to a time a thousand years before they had first arrived on the ship with the TARDIS traveling back in time to meet them thanks to the Time Lords. They discover that the space station has come under some sort of plague and is orbiting the planet of Voga, a planet of Gold. 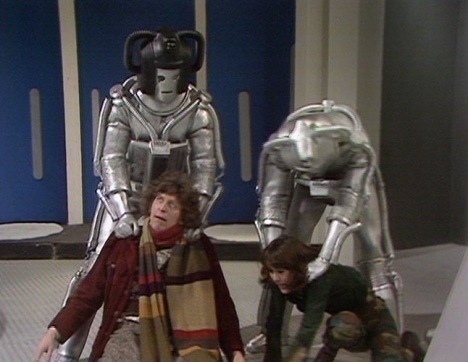 As it turns out the crew have not been dying from a plague but rather an attack by the Cybermen who intend to use the space station to destroy Voga. Voga is the planet of gold and during the great Cyber War, the Cybermen were defeated by Voga because their gold sticks to the Cybermen's breathing apparatus and suffocates them. It's up to the Doctor to stop the human spy, stop the Cybermen, and save Voga from internal conflict as well as external destruction. This one is not very good. This is the first time we have seen the Cybermen since Season Six with Patrick Troughton, and because they were used so terribly here, we won't see them again for seven more seasons. 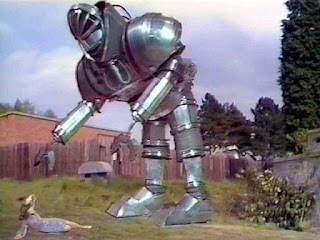 This story introduced the Cybermen's allergy to gold which is occasionally used well but usually used ridiculously. Honestly this one's a skip. I had to look up the wiki article on this story because the only two things I remembered about this story was that Voga was the planet of Gold, and The Doctor shouts "HARRY SULLIVAN IS AN IMBECILE!" at the top of his lungs. 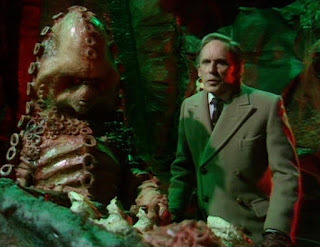 The first story of season thirteen is Terror of the Zygons and it's four episodes long. Immediately following the Cybermen's defeat at Voga, the Doctor receives a transmission from the Brigadier that they must return to Earth immediately. A series of oil rigs in Scotland are being destroyed and nobody knows the cause. When a survivor of the attack washes up on the moor, Harry attempts to help the man but is shot by someone; the survivor being fatally shot. The Doctor and Sarah return from investigating to see Harry but his bed is empty and the pair are locked in a chamber with the air pumped out. Thankfully Sergeant Benton finds them in time. Harry, as it turns out, has been taken to a spaceship deep underwater controlled by creatures called Zygons who can transform their bodies to look like others and have replaced several notable people over the last few years. Their plan is to conquer Earth using the Loch Ness Monster (which is actually an alien creature) upgraded with cybernetics. Eventually the Zygons send the Loch Ness Monster to attack the Prime Minister and it's up to the Doctor and UNIT to stop the scheme. In the end, Harry decides to stay back with UNIT as the Doctor and Sarah Jane leave for the stars. This is a very good story and only partially because you see the Brigadier wearing a kilt through most of the story! This story, of course, introduced the Zygons who are yet another one of those iconic alien races that we only see once in the classic show. These aliens hit a home run in a major way because of their abilities, how alien they look, and their whispering voices. It's a shame that we won't get to see them again until the 50th anniversary episode in about 38 years. Also, this ended the stream of Tom Baker stories that definitely happen one right after the other. You should really check this one out. The next story is Planet of Evil and it's four episodes long. The TARDIS lands on the planet of Zeta Minor where the Doctor and Sarah Jane discover a geological expedition has been wiped out by an unseen killer with only one man left, Professor Sorenson. At the same time, a military investigation team lands to find out what happened to the scientists. They blame the Doctor for the deaths but eventually find the killer to be a creature from a universe of antimatter. 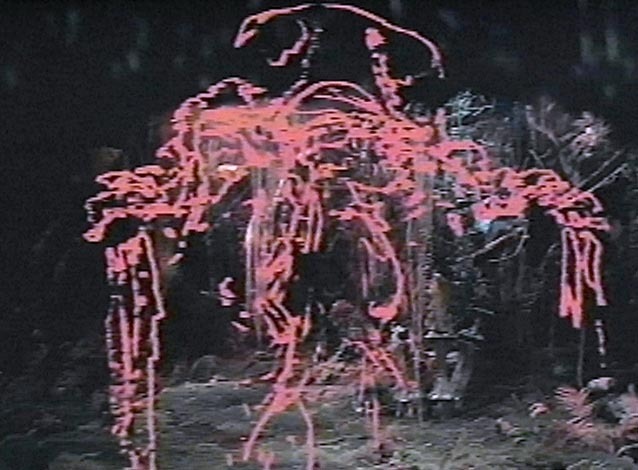 The creature was angered when Sorenson took antimatter samples from around the pit that connects the two universes. The military ship takes off but is dragged back down to towards Zeta Minor due to the antimatter on board the ship. Sorenson also begins transforming into (*snort*...sorry) the Antiman and begins draining people's life force using antimatter abilities he cannot control. Eventually the Doctor takes Sorenson and the samples back to Zeta Minor and tosses them into the pit. The antimatter creature is appeased and gives Sorenson back without his mutation allowing the military and Sorenson to leave the planet. This story is mostly forgettable with the exception of the way in which the antimatter creature looks, and the utterly ridiculous name that they gave Sorenson when he had mutated. Having a pit that leads to another universe was a good idea but the fairly ok paint-by-numbers feel to the rest of it just makes this adequate at best. Watch it if you feel like it. The next story is Pyramids of Mars and it's four episodes long. The TARDIS is forced out of its intended flight path when Sarah Jane suddenly sees an apparition in the console room. 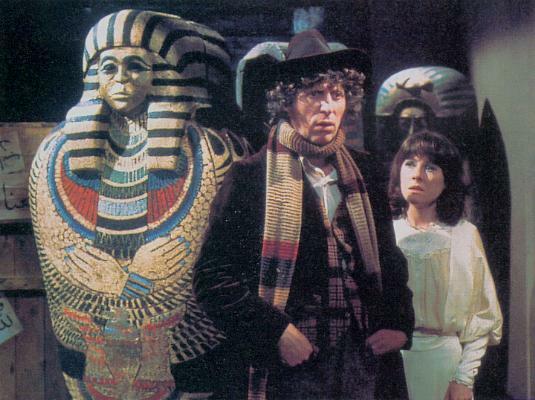 The Doctor lands the TARDIS in a priory where there are several Egyptian artifacts. An Egyptian who has recently been taken over sends a robot disguised as a mummy after the Doctor and Sarah Jane who escape to a nearby hunting lodge. The man there is an amateur scientist and has created a device that is receiving signals from Mars. The signal is "Beware Sutekh" The Doctor explains that Sutekh is the last remaining member of an ancient race known as the Osirans who was banished to an eternal prison on Mars for his cruelty; the Egyptians worshiped them as gods. Using a time corridor in the priory, Sutekh sends his servant to kill the Egyptian and take over efforts to free Sutekh from his prison by building a rocket. The Doctor and Sarah Jane halt this by exploding the rocket, but the explosion is contained by Sutekh's telekinetic power. The Doctor jumps into the time corridor to distract Sutekh causing him to loosen his control and allow the explosion to take place. Unfortunately, the Doctor is stuck on Mars and Sutekh uses his mental powers to control the Doctor, send him back to the priory and use the TARDIS so his servant and a robot could come to Mars and destroy the artifact keeping him imprisoned. The Doctor eventually breaks free of the mind control and goes through a series of logic puzzles to reach Sutekh's servant but he is too late. The servant destroys the Eye of Horace and crumbles to dust. Thinking quickly, the Doctor returns to the priory and uses the TARDIS power to extent the time corridor that Sutekh was using to reach earth out for 10,000 years meaning Sutekh would die before reaching Earth. This story is fantastic! This is an absolute must see. Not only is it great but it has one of the best voiced villains in the entire series. I honestly don't know what else to say about it other than the fact that you need to watch it! The next story is The Android Invasion and it's four episodes long. The Doctor has agreed to head back to Earth however once the TARDIS lands it appears that the coordinates are off somehow. The Doctor and Sarah Jane have found themselves in an abandoned village. 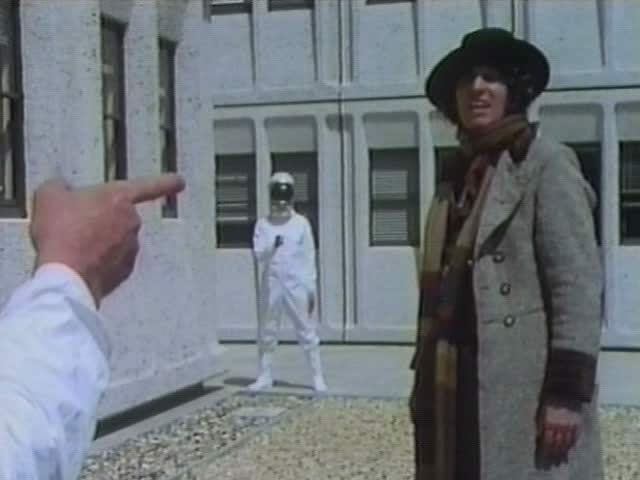 Something seems very off as the town is filled with newly minted money, a calendar only has one day repeated, strange men in space suits are patrolling around, and UNIT is being headed by someone other than the Brigadier. It turns out that this is a testing facility for an alien race known as the Kraals to test their android technology. They intend to use these androids to conquer Earth little by little. During the confusion, Sarah Jane gets kidnapped and duplicated as an android. It's up to the Doctor to realize his companion has been swapped and stop the Kraals from initiating their plan. This is a fairly standard story with middle-of-the-road quality. There's a good mystery and some inventive aliens. There just isn't much that stands out. It's not a bad story by any means it just has the unfortunate luck to be position between two absolutely brilliant classic stories. If android duplicates interest you then give this one a try. The next story is The Brain of Morbius and it's four episodes long. The TARDIS lands on the planet of Karn and the Doctor believes it is the Time Lords who have sent him. The Doctor and Sarah Jane find a castle and meet it's owner, a surgeon named Solon. Solon is secretly trying to build a new body for the evil Time Lord Morbius who was executed and thought dead for many years. Meanwhile, the Sisterhood of Karn, a group of ladies who guard the "sacred flame" which gives eternal life are having trouble as the fire is going out and they fear the Time Lords have sent the Doctor to steal the elixer of life. 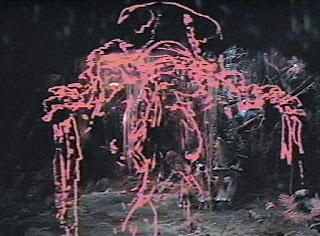 Solon decides to use the Doctor's head as the final piece of Morbius' new body and drugs him. However, the sisterhood teleport the Doctor to their headquarters and set to burn him at the stake. 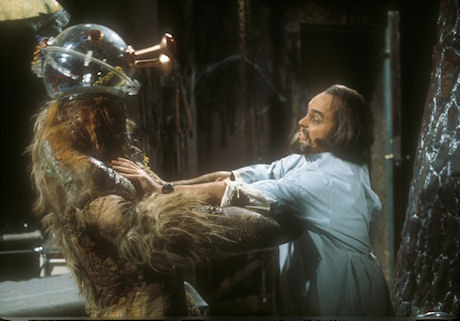 Solon speaks with Morbius' brain which is being kept in a jar and decides to use Sarah Jane's head instead. Eventually the Sisterhood and the Doctor reach an understanding as he restores the flame of life by removing the soot blocking the hole. When Sarah Jane is rescued by the Doctor, Solon decides to use a mechanical head and places Morbius' mind inside the body. Morbius is alive once again and out of control. The Doctor challenges Morbius to a mind battle in an attempt to save the galaxy from the most vile Time Lord in existence. Yet another absolutely fantastic story and a must-see! The most important thing to come from this story is the Sisterhood of Karn; the group of immortal women who were good friends with the Time Lords for many years. Although this was their only appearance in the classic show, the new show was wise to remember their existence and brought them back into public consciousness around the 50th anniversary episode as well as Season 9. One of the more "controversial" parts of this episode is he Mind Battle. 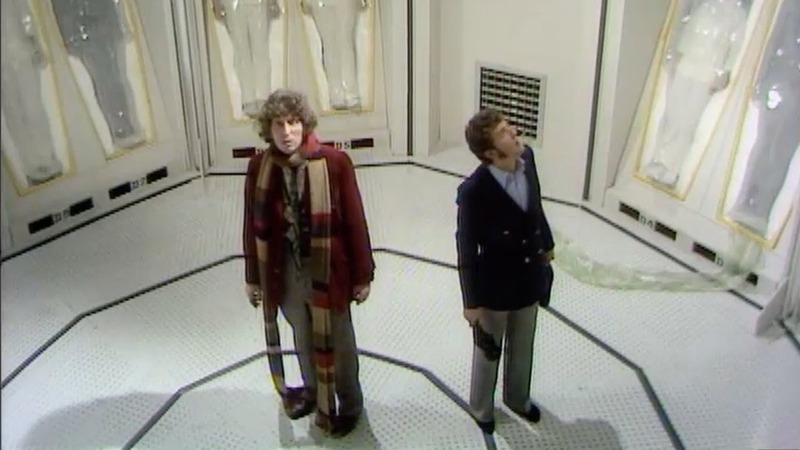 Both the Doctor and Morbius are strapped to a machine and the Doctor's past regenerations are seen. Unfortunately, the pictures keep going after William Hartnell. It was originally intended that the First Doctor was not his first life. However, next season's "The Deadly Assassin" happened in which it was mentioned the number of regenerations a Time Lord has per cycle so everything seen here was tossed out of continuity. The Doctor Who Community, however, came up with the theory that these faces were actually Morbius' previous versions. Either way, give this one a watch! The last story of Season Thirteen is The Seeds of Doom and it's six episodes long. When a strange plant pod is discovered in Antarctica, the Doctor recognizes the photo as alien and heads off to Antarctica with Sarah Jane. The pod opens and attaches itself to a scientist, slowly turning him into a plant-like alien called a Krynoid. Meanwhile, word of this rare pod has reached an insane plant enthusiast, Harrison Chase. Chase sends two men to Antarctica to steal the pod for his collection. The Doctor, Sarah Jane, and the two henchmen arrive to find that the Krynoid man has killed everyone else in the base. The Doctor remembers that Krynoid pods come in pairs and goes after the Krynoid. The henchmen steal the second pod and place a bomb in the base which explodes, killing the Krynoid. In England, Chase is examining the pod when it too opens and attaches itself to one of the henchmen. Just like in Antarctica, the man starts turning into a Krynoid. Chase has decided to work with the Krynoid so that plants can rule the world. 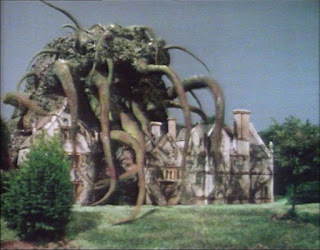 The Doctor and Sarah Jane contact UNIT and enter Chase's mansion to stop the Krynoid, however the alien has grown too large and is about to germinate all of England. Can UNIT strike it down before it's too late? Well yeah, of course they do! This is yet another good episode that you may want to check out. The early Tom Baker stories are by far some of the best stories in the classic show. We have about two more seasons worth of really great stuff until the quality takes a nosedive that won't recover until the 7th Doctor. One of the most notable things about this story is the brutality in a couple of the deaths. While many deaths have been uncomfortable in the history of the show, this story has two people being pulled into a compost shredder! Geez! That was Seasons Twelve and Thirteen of Classic Doctor Who. If I haven't made it abundantly clear yet, many of the stories from Tom Baker's first two seasons are absolute classics and must-sees. The writers were on a roll and were constantly producing high quality work. This high quality coupled with Tom Baker's own eccentricity that he brought to the role (most of it purely because that was his own personality) made this era one of the best out of both the classic and new shows combined. 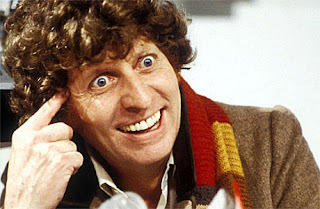 There's a reason that Tom Baker is still the most iconic Doctor and most likely always will be. Just check out these episodes and you'll see why. Thankfully we have two more seasons of awesomeness before the quality starts to drop a bit, then a bit more, then a LOT more. Please join me again as we continue to examine all of Doctor Who.